phones from every major brand for any budget. 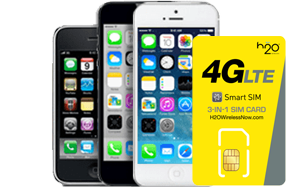 No contract wireless services on the nation's' largest and most reliable GSM network. Get Monthly Unlimited and Pay As You Go plans with phones from every major brand for any budget. * Promotion requires new service line or ported number and activation of one (1) h2o® Wireless $30 Monthly Unlimited Plan before March 31, 2019 to be eligible to receive 3 GB FREE 4G LTE data (Bonus Data) for first month and two (2) subsequent recharges. Subsequent second and third recharges must also be made by March 31, 2019 in order to receive Bonus Data for second and third recharges. After initial recharge, and two (2) subsequent recharges, the data allotment is reverted back to the following: 3 GB for $30 Monthly Unlimited Plan for subsequent plan cycles. 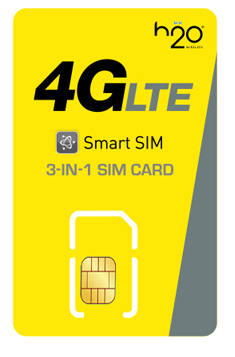 1 Promotion req’s new svc line or ported number and activation of one (1) h2o® Wireless $20, $30, $35, or $40 Monthly Unlimited Plan by March 31, 2019 to be eligible to receive 3 months bonus 4G LTE data for three plan cycles only. No code req’d. Fees, charges, & restr’s apply. Subsequent second and third recharges of one (1) h2o® Wireless $20, $30, $35, or $40 Monthly Unlimited Plan must be made by July 31, 2019 in order to receive the additional 4G LTE data for second and third recharges; if you switch between plans or renew a plan before expiration, the data of your prior plan will no longer be available (i.e. no stacking). After three plan cycles, the data allotments are reverted back to the following: 500MB for $20 plan; 3GB for $30 plan; 4GB for $35 plan; 7GB for $40 plan for subsequent plan cycles. Limited time offer. Promotion excludes: h2o® Wireless (“h2o”) $50/$60 Monthly Unlimited Plans; h2o® Wireless Pay-As-You-Go plans; h2o® BOLT; and easyGO. Limit: One (1) Promotion per qualifying line max. Promotion may not be combined with Multi-Line Program. Full terms and conditions at www.h2owirelessnow.com. Limited time offer. New customers only, valid for the customer's initial recharge. Promotion req’s new svc line or ported number for one (1) h2o® Wireless $30 Monthly Unlimited Plan (Eligible Plan) between 00:01AM ET on July 1, 2017 and midnight ET on September 30, 2017 (Promotion Term) to be eligible to receive FREE 4G LTE data (Promotional Data) as follows: 3GB for $30 plan. Promotion excludes: h2o® Wireless Pay-As-You-Go plans; h2o® Broadband; h2o® BOLT; easyGO. Limit: One (1) Promotion per qualifying line; max. 1 GB of Promotional Data per line. Promotion may not be combined with any other offer, promotion, or discount & cannot be applied to previously placed orders. h2o® Wireless service is for personal use in the U.S. Capable device required for 4G LTE speeds. Speeds limited by device/location. Unused accumulated data, including Bonus Data, is forfeited if you switch between plans, terminate or fail to renew your plan before expiration. “Unlimited” does not mean unreasonable commercial/monitoring/abusive use; see full terms on our website for all prohibited uses. Monthly plans expire 30 days after loaded to account. If you switch between plans or renew a plan before expiration, the features associated with your prior plan will no longer be available unless otherwise specified. Directory assistance, premium SMS, no answer/busy transfer, caller ID, caller ID block, & roaming not available. Unused Data/Bonus Data/Refills/promotions are not redeemable for cash, have no cash value & are not transferable or refundable. Taxes/fees charged where applicable. Plans/rates/fees/promotions subject to change without notice. Coverage & service not available in all areas. h2o® Wireless service is powered by Locus Telecommunications, LLC. © 2017 Locus. Int’l services provided by Touch-Tel USA, LLC. All rights reserved. 3 Unlimited International Talk: Unlimited landline calls to 50+ Countries; select countries also include unlimited calls to cell phones. Each monthly plan account can dial up to 10 unique international telephone numbers each month which resets upon the 1st of each month, regardless of plan expiration. Calls to countries other than the U.S. will be terminated at 60 minutes, but you may re-initiate the call thereafter. Does not apply to calls to off network/ special locations. 4 International Talk Credit: Unused international talk credit can’t be replenished if used prior to end of plan cycle and won’t roll over to the next plan cycle. For International Calling please dial 1-562-252-0100 and follow the prompts to complete your call. $10, $20, $30, $100 plans includes free international calling rates to 50 countries, however, standard calling rates of 5c/min apply. International calling rates apply to all other countries + standard calling rates of 5¢/min. Does not apply to calls off network/special locations. $25 plan includes $5 International Talk Credit. International Talk rates apply. For rates, visit h2owirelessnow.com/international. International Talk credit does not roll over upon plan expiration and cannot be replenished if used prior to plan expiration. Standard rates of 2.5/min apply. H2O Wireless (“H2O”) service is for personal use in the U.S. Calls rounded up to the nearest whole minute. Airtime charges incurred on inbound/outbound calls and voicemail deposits/retrievals. You will be charged for all messages sent (per recipient) by you or to you, regardless of receipt. Data usage applies for sending/receiving MMS. Data usage rounded up to the nearest KB each use. Data speeds limited by device capability/location. International calls charged at the applicable international rate plus airtime, except for select international destinations that are included at no extra charge (i.e. airtime charge only). Unused balance does not roll over. By purchasing H2O products, you agree to the full H2O Terms & Conditions. Refills have no cash redemption value and are nonrefundable even upon account cancellation. Your account and phone number will be cancelled if the balance remains at $0 for 30 consecutive days. Taxes/fees charged where applicable. Plans/rates/fees subject to change without notice. Service not available in all areas. For full terms and conditions, click here.